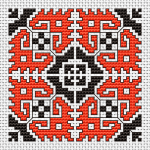 Bicolor motif in black and orange based on traditional Bulgarian embroidery. Very appropriate for making small gifts, such as biscornus, that will delight your relatives and friends for birthdays and other occasions. If you do not like the current colors - just change them.Try variegated threads or any extras from previous projects. 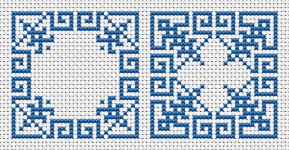 Cross stitch stripe that marks your place in books and can also embellish belts or bracelets. Personalize the bookmark with threads of your choice. 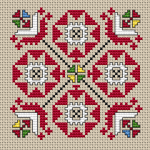 A beautiful motif based on traditional Bulgarian embroidery. The pattern contains full stitches and back stitches. These elaborate, square-shaped designs are used to decorate both sides of a biscornu. The pattern is monochrome, sewn entirely with full stitches. 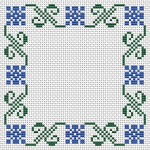 An easy cross stitch pattern with two colors - blue and green. Also suitable for making biscornu, small photo frames, borders and other projects. 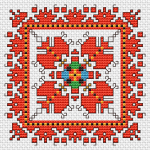 A colorful pattern based on traditional Bulgarian cross stitch.Suitable for biscornu making and contains full stitches and back stitches. 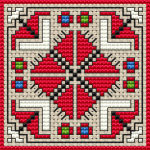 Beautiful and bright motif of Bulgarian Traditional Embroidery.Contains full cross stitch and backstitch, also suitable for making biscornu. 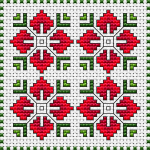 Floral biscornu cross stitch pattern in red and green shades on white fabric 14 ct.
Bookmark free cross stitch pattern based on traditional Bulgarian embroidery.Design for Sky Blue Aida 14 ct.
Bulgarian folk motif cross stitch pattern.Suitable for biscornu making. 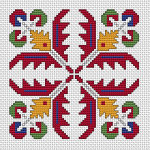 A motif from the old Bulgarian folklore embroidery.Bookmark cross stitch pattern with geometric shapes and а border. 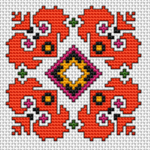 Traditional Bulgarian embroidery.A colorful motif pattern for biscornu making.